Out of a former recultivated open-cast mining site, a paradise for water fans has been created over the past decade, located directly at the southern outskirts of Görlitz. The Berzdorf Lake covering an area of 1,000 hectares is 72 metres deep, and it is not only the fifth-biggest lake in Saxony, but meanwhile, ranks among the most popular ones, too. This nature paradise convinces you with its fine water quality and offers fantastic conditions to swimmers, surfers, sailors, as well as cyclists and skaters. In the future, more offers shall be developed and combined to create a unique experience all around the lake. Görlitz has its own mountain, the Landeskrone. Arising 419.5m above sea level, it is the widely visible landmark of the city. The natural reserve, located in a residential area called Biesnitz, is ideal for walking, and you can easily get there by tram. If you make it up to the top of the mountain, you will be rewarded with a great view to the city, over the lake and the surroundings. 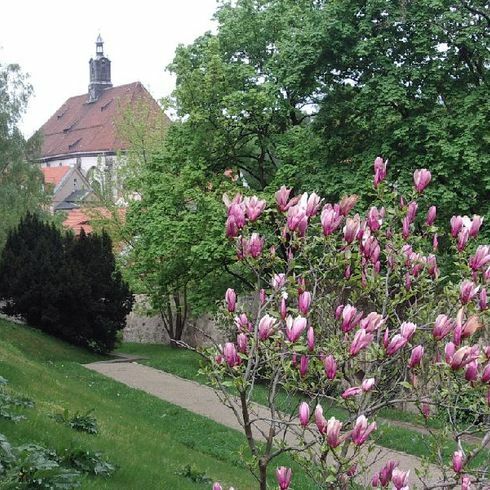 Görlitz is known as a city of parks and gardens. Historic listed garden areas are located next to areas in modern design. There is a range from small open spaces in the neighbourhood to green belts connecting several residential districts, all of them standing for leisure, recreation and natural environment.